February 16, 1970 - A Cuban successfully hijacked a B-727 from Newark, NJ to Havana, Cuba. March 11, 1970 - A man successfully hijacked a B-727 from Cleveland, OH to Havana, Cuba. March 17, 1970 - The first death in a domestic U.S. aircraft hijacking incident occurred when a hijacker shot and killed the copilot on an Eastern Airlines DC-9 shuttle between Newark and Boston. Although fatally wounded, the copilot still managed to shoot and severely wound the hijacker with his own gun. 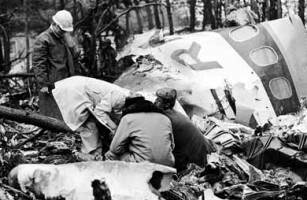 The aircraft's captain, himself wounded in both arms landed his DC-9 safely in Boston. The hijacker, 8 months later, hanged himself while awaiting trial. 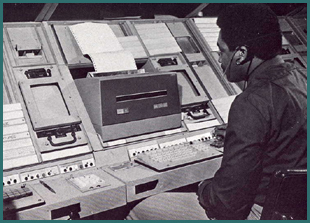 March 19, 1970 - Air Traffic Control for coast-to coast automated flight data processing (FDP) was demonstrated when the Denver and Los Angeles ARTCC computers were linked. The next part of the NAS En Route Stage A automation would be Radar Data Processing (RDP). 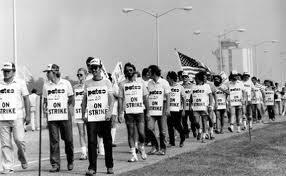 March 25 - April 10, 1970 - Over 3,000 PATCO en route controllers engaged in a "sick-out" strike, claiming to be fatigued and to be acting in the interests of their health. Some remained absent for a day or two, others for the entire 17-day period. 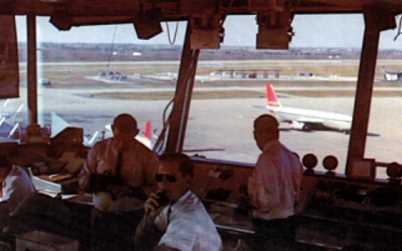 The government's conflict with air traffic controllers involved a challenge to the efficacy of FAA equipment and safety procedures as well as salary, working conditions and rivalry among unions. FAA decided to ignore PATCO's protests and carry out the involuntary transfer of 3 controllers from the Baton Rouge combined station-tower. The absentees claimed sick leave, but the DOT viewed their action as a strike against the U.S. government and hence illegal. April, 1970 - The Government issued a temporary restraining order against PATCO. When the union failed to comply with this order, a 'show-cause' order was obtained against its officers. During the hearing on the 'show-cause' order, PATCO agreed to call off the "sickout." FAA suspended nearly 1,000 controllers and fired 52 for their role in the affair. April 23, 1970 - John F. Leyden, newly elected president of PATCO, told the union's membership of his intention to introduce realism into the organization... "to eliminate a 'showboat-gunboat' approach, to replace it with a firm and reasonable persuasion." Nevertheless, PATCO used slowdowns as a tactic during Leyden's tenure. April 27, 1970 - The Central Flow Control Facility was established at FAA Headquarters in Washington DC. The facility was responsible for reducing flight delays by restricting the number of aircraft between Air Traffic Control Centers. Central Flow Control, with 5 NWS weather forecasters, and direct access to 20 ARTCC's, as well as some key TRACONS (e.g. O'Hare and NY TRACONS), identified potential trouble areas and suggested restrictions or rerouting of aircraft. May 25, 1970 - A Latino successfully hijacked a B-727 from Chicago, Illinois to Havana, Cuba. 3. A VOR or TACAN Navigational Receiver. When these TCA requirements were implemented, the FAA noted that the potential number of general aviation aircraft at crowded terminals greatly decreased and airline pilots were less distracted and able to enjoy a safer environment. FAA's safety standards, under the Airport Development Aid Program (ADAP) and a Federal aviation trust fund derived from taxes, required all air carrier airports to meet standards for air navigation facilities, runways and fire-and-rescue equipment. July 1, 1970 - A man successfully hijacked a DC-8 from Las Vegas, Nevada to Havana, Cuba. July 29, 1970 - The FAA established the Air Traffic Control Systems Command Center which integrated the functions of the Central Flow Control Facility, Airport Reservation Office, Air Traffic Service Contingency Command Post and the Central Altitude Reservation Facility. 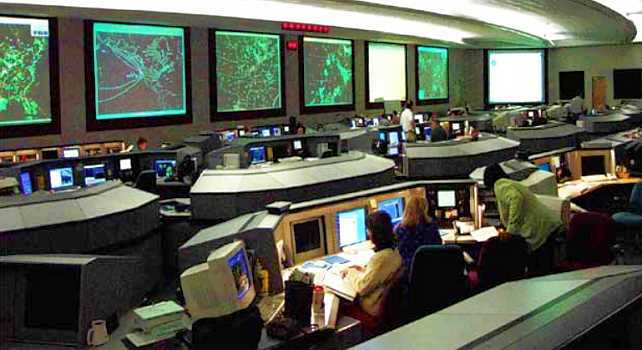 The ATC System Command Center regulates air traffic when weather, equipment, runway closures, or other conditions put stress on the National Airspace System (NAS). In cooperation with Airline Personnel, Traffic Management Personnel at ATC facilities, and Air Traffic Controllers, en route delays and congestion are minimized and the National Airspace System ensures the safe and efficient air travel within the United States. For a detailed manuscript of "ATCSSS Traffic Management/Flow Control" by John Gibbs: Click here. August, 1970 - Three successful hijackings occurred in August: a Latino hijacks a plane from New York; three men hijack a DC-3 from Newark, and one man hijacked a DC-9 from Atlanta, Georgia to Havana, Cuba. August 2, 1970 - A man hijacked a Pan American Airways B-747 bound for San Juan from New York , to Havana, Cuba. 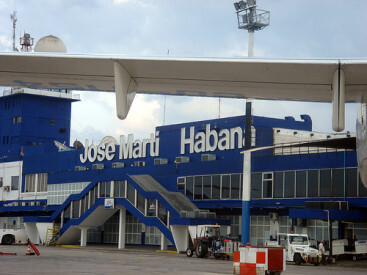 This was the first hijacking of the newly-introduced B-747 to Cuba and Premiere Fidel Castro came out to Havana's Jose Marti Airport to see the new airliner for himself. Castro reportedly met in person with the Pan Am pilot Captain Augustus Watkins and expressed concerns over the ability of the big plane to take off safely from the small airport, but was reassured by the Pan Am captain. "Captain Watkins was quite shaken by the time the jet was on the ground at Havana, and when Cuban officials came to the flight deck, the Co-pilot, Leo John Riso, was presented to them as the captain. 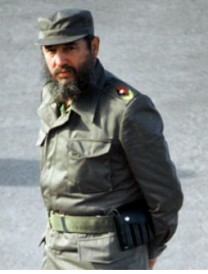 Co-pilot Riso was taken to meet Fidel Castro face-to-face, and they had a brief conversation in which he was reassured that the aircraft would be allowed to depart once payment had been made for services rendered (refueling, landing fees etc.)" "These facts are known to me because the Co-pilot, John Riso, was my father and this story was kept within the family for many years out of consideration of Captain Watkins." "The original news story was based solely on a contemporary Associated Press item which was widely published." "My father, John Riso, died in November, 2013 and to the best of my knowledge, Captain Watkins is no longer living." September 19, 1970 - A man successfully hijacked a B-727 from Pittsburgh, PA to Havana, Cuba. 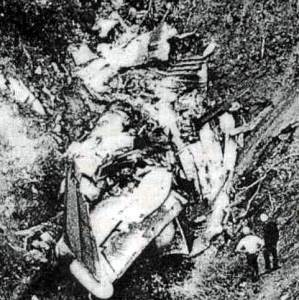 The Martin-404, (20 years old), had been in storage until a month before the crash, and the plane had not been registered until the day before it crashed. Also the company was not certified to fly any aircraft heavier than 12,500 pounds, and that the Martin-404 weighed nearly four times that much. 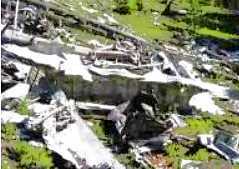 Additionally, the plane may have been as much as 4,000 pounds overweight when it struck the mountain. Probable cause: Pilot errors, including poor in-flight decisions and inadequate pre-flight planning led to the crash. 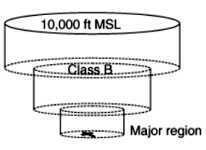 The intentional operation of the Martin-404 over a mountain route at an altitude from which they could neither climb over, nor execute a course reversal was a causal factor. Another was the overloaded condition of the aircraft and a lack of understanding by the crew of the performance capabilities and limitations of the Martin-404, as well as the lack of operational management to monitor and appropriately control the actions of the flight crew. FAA began an investigation of the charter airplane industry and the methods used in policing it. All of planes owned by Golden Eagle Aviation were grounded, they were fined $50,000, and their license was revoked. October 30, 1970 - A Latino successfully hijacked a DC-8 from Miami to Cuba. November, 1970 - Two successful hijackings occurred in November: A B-727 from San Diego and another airliner from Raleigh, NC to Havana, Cuba. November 14, 1970 - Huntington, West Virginia - A Southern Airways Douglas DC-9 crashed short of the runway at Tri-State Airport. 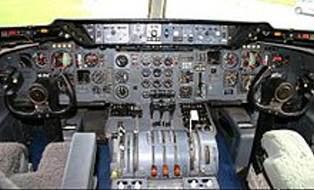 Improper procedures executed by the crew included a descent below Minimum Descent Altitude during a non-precision approach under adverse operating conditions, without visual contact with the runway environment and the first officer not making all of the call outs, and the captain using the autopilot throughout the approach. Air Traffic Control advised the crew that there was "rain, fog, smoke and a ragged ceiling" making landing more difficult, but not impossible. When the crew reported passing the outer marker, they received a landing clearance. On final approach the DC-9 collided with the tops of trees on a hillside a mile west of the runway, and burst into flames. The NTSB report said the accident was 'unsurvivable'. The DC-9 had dipped to the right, almost inverted and had crashed into a hollow 'nose-first'. The fire was very intense and the fuselage was reduced to a 'powder-like substance. 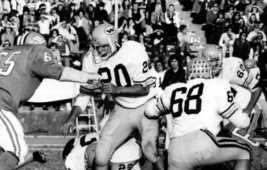 Thirty-six players and 5 coaches of the Marshall University Thundering Herd football team were killed. The NTSB concluded that the accident was the result of a descent below Minimum Descent Altitude during a non-precision approach under adverse operating conditions, without visual contact with the runway. 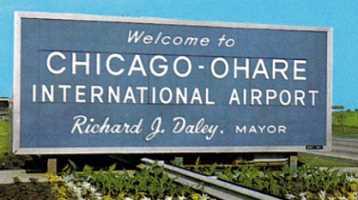 December, 1970 - Chicago's O'Hare Airport (ORD) received the first (Automated Radar Terminal System) ARTS III for the automation of Air Traffic Control. January 22, 1971 - A man successfully hijacked a B-727 from Milwaukee, Wisconsin to Havana, Cuba. 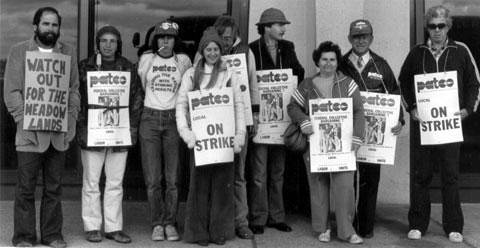 January 29, 1971 - An official finding by the Department of Labor that the 17-day strike in March and April 1970 was a strike against the Government caused PATCO to be divested of its union status. It was allowed to regain status if it would not permit another strike again. February, 1971 - Two successful hijackings occurred in February: A DC-9 from Chicago, IL and a B-727 from San Francisco to Havana, Cuba. March 31, 1971 - A Latino successfully hijacked a DC-8 from New York to Havana, Cuba. 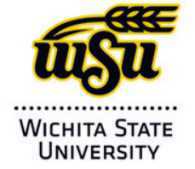 May 3, 1971 - FAA's Management Training School in Lawton, Oklahoma at Cameron College admitted its first class. Some eyewitnesses reported that the F-4B's left wing impacted the center of the DC-9 fuselage immediately after performing a barrel roll. Others claimed the F-4B ripped a large hole in the fuselage of the DC-9. The NTSB report said the F-4B had attempted to swerve away from the DC-9 immediately prior to impact, and that an additional 10 feet would have averted the collision. They also confirmed that the fighter had impacted the DC-9 in two places, with its left wing impacting the DC-9's forward passenger cabin and the vertical stabilizer 'slicing through' the cockpit. Probable Cause: Failure of both crews to see and avoid each other. Also a very high closure rate and commingling of IFR and VFR traffic in an area where the limitation of the ATC system precludes effective separation of such traffic. Also the failure of the crew of the F-4B to request radar advisory service, particularly since they had an inoperable transponder. 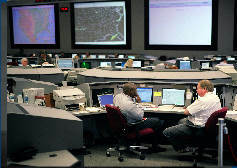 The FAA responded to NTSB recommendations by installing video and audio surveillance in air traffic control facilities, by providing air traffic controlled airspace for the entire duration of all IFR air traffic, and by establishing better, definitive procedures for the spotting and tracking of transponder code '7700' aircraft (emergency transponder code). Additionally, the FAA and the Department of Defense cooperated to develop a program to mitigate collisions and near-misses between civilian and military aircraft. Probable cause: The captain's decision to descend below the prescribed minimum descent altitude without adequate forward visibility or sighting the runway. The captain disregarded advisories from his first officer that minimum descent altitude had been reached and the CV-580 continued descent at a normal rate and airspeed. The FAA recommended a more comprehensive and reliable flight test for evaluating a pilot's capability and competency to serve as pilot-in-command of aircraft used in air transportation. July 24, 1971 - A Cuban successfully hijacked a DC-8 from Miami, Fl to Havana, Cuba. July 29, 1971 - The First McDonnell Douglas DC-10 (380 passengers) medium to long range trijet airliner was type-certified by the FAA. Production of the DC-10 ended in 1989 with 386 delivered to airlines and 60 to the USAF as air-to-air refueling tankers (KC-10). 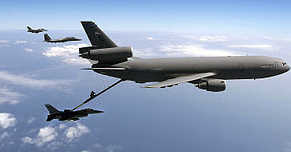 The KC-10 was central to the airlift and aerial refueling effort in the Gulf War. McDonnell Douglas, in 1990, replaced the DC-10 with the MD-11, with increased wingspan with winglets, new engines and increased use of composite materials, and reduced the flight deck crew from three to two by eliminating the necessity for a flight engineer. 200 MD-11's were built. 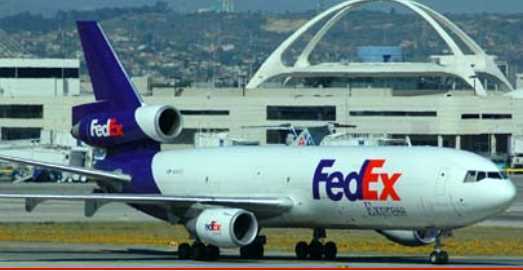 Federal Express, US cargo airline was the largest operator of the DC-10's. 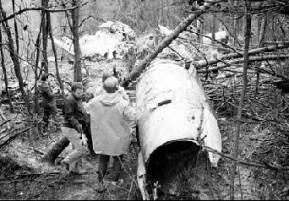 September 4, 1971 - Juneau, Alaska - An Alaska Airlines B-727 crashed into a mountain while executing a non-precision NDB approach to Juneau. Premature start of the final descent was made by the Captain. The crew did not use all available navigational aids to check the flight's progress along the localizer. They also did not perform the required audio identification of the pertinent navigational facilities. This was the first fatal jet crash of Alaska Airlines. The probable cause of the crash was a display of misleading navigational information concerning the flight's progress along the localizer course. October, 1971 - Two hijackings occurred in October: A man hijacks a B-727 from Detroit, MI and a man, his two sons and a third youth hijacked an Eastern Airlines jet to Havana, Cuba. B-727 flying from Portland to Seattle. He received $200,000. and parachuted from the plane. The actual name of the hijacker remains unknown. The hijacker showed a flight attendant what appeared to be a bomb (wires and what looked like dynamite); then he sent a message to the pilot to keep the plane in the air and a request for the ransom money and parachutes. The flight landed in Seattle, and FBI agents provided the ransom money (21 pounds of $20 bills $200,000) which he strapped to his chest, and parachutes. D.B. Cooper used cash to buy a one-way ticket on Northwest Flight 305, leaving Portland, Oregon bound for Seattle. He wore a business suit with a black tie and white shirt. After ordering a bourbon and soda, he passed a note to a stewardess that explained he had a bomb in his briefcase. The stunned stewardess did as she was told. Opening a cheap attaché case, Cooper showed her a glimpse of a mass of wires and red colored sticks and demanded that she write down what he told her. She took the new note to the captain that demanded four parachutes and $200,000 in twenty-dollar bills. Cooper demanded the $200,000 in 'negotiable' American currency; 4 parachutes (two primary and two reserve); and a fuel truck standing by in Seattle to refuel the aircraft upon arrival. The pilot, William Scott, through Seattle-Tacoma Airport Air Traffic Control informed local and federal authorities. The 36 other passengers were informed that their arrival in Seattle would be delayed because of a "minor mechanical difficulty". Northwest Airlines president, Donald Nyrop, authorized payment of the ransom and ordered all employees to cooperate fully with the hijacker. The aircraft circled Puget Sound for approximately two hours to allow Seattle police and the FBI time to assemble Cooper's parachutes and ransom money and to mobilize emergency personnel. D. B. Cooper then released all passengers and one flight attendant. After refueling, the aircraft took off again and flew toward Reno, NV. He demanded that the pilot fly with landing gear down, flaps set to 15 degrees and not to exceed 170 mph. Cooper opened the aft stairs and jumped from the plane with a parachute during a heavy rainstorm, from 10,000' into the black night. The temperature outside the plane was 7 below and the wind chill 70 below zero. The aircraft was forced to land with the aft stairs deployed. The case is still unsolved, but the FBI believes Cooper most likely did not survive. An FBI Special Agent said: "No experienced parachutist would have jumped in the pitch-black-night, in the rain, with a 200-mile-an-hour wind in his face, wearing loafers and a trench coat. It was simply too risky. He also missed that his reserve chute was only for training and had been sewn shut -- something a skilled skydiver would have checked. Consequently FBI investigators believed he was not an experienced skydiver, possibly with military experience. On January 6, 1972, in a 'Sled Drop' test conducted by the FBI, NWA, and the USAF, two 250 lb. sleds from the actual hijacked jet using one of the original Flight Crew as pilot. 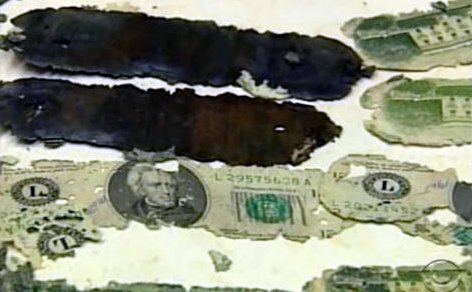 In February, 1980, and 8-year old boy was digging in the sand along the Columbia River (between Washington and Oregon) and found three bundles of twenties ($5,800) in deteriorating condition. 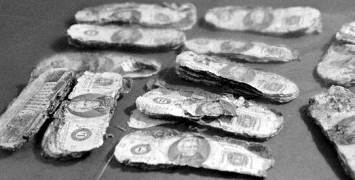 They were turned over to the FBI, serial numbers were matched from the ransom money. "D.B. Cooper Days" - Ariel, Washington -- Every year since 2011 the D.B. Cooper Days are held at the Ariel Store and Tavern, celebrating the skyjacking case of D.B. Cooper, who hijacked the Northwest B-727 in 1971. After several "copycat" hijackings in 1972, the FAA required that all Boeing 727 aircraft be fitted with a device, later called the "cooper vane", that prevents lowering of the aft air stair during flight. July 12, 2016 -- The FBI is no longer investigating the mystery of the D.B. Cooper skyjacker. Nearly 45 years ago D.B. Cooper vanished out the back of a Northwest Orient Airlines Boeing-727 into freezing Northwest rain wearing a business suit, a parachute and a pack with $200,000 in cash. Evidence obtained during the course of the investigation will now be preserved for historical purposes at FBI Headquarters in Washington, D.C.